Lenten rose (Helleborus x hybridus), a perennial belonging to the buttercup family, is not actually a rose. Its two-part common name refers to the plant's bloom season (around Lent) and the rose-like shape of its flower buds. Valued for its early blooms of purple, red, yellow, green, blue, lavender, and pink, and its leathery evergreen foliage, Lenten roses contribute good color throughout the growing season. The flowers—actually sepals, which are similar to petals but longer-lasting—are large (3 to 4 inches in diameter) and hang downward in clusters from thick stems that rise above the foliage. In addition to the color variations, there may be variations in markings, such as margins of a different color, showy freckling, or cool veining. Flowering initially occurs near ground level, below last year's leaves. Hellebores can be planted in early fall or late spring and have a long (eight- to 10-week) bloom period. When they reseed and spread to fill in an area, their attractive foliage makes them a gorgeous ground cover. Lenten rose will also naturalize under the right conditions. But if you wish to keep your Lenten roses as single specimens, well-established seedlings can be transplanted to another part of your garden. Lenten rose is one of the easiest plants to grow, requiring little care. Keeping the soil moist and mulching in early winter will encourage the plants to grow, but once established, hellebores can tolerate drier conditions. Plant them in early fall or late spring in a partially or fully shady spot, but keep them sheltered from harsh winter winds. Many gardeners like to take full advantage of this perennial's early-blooming quality by locating it in a spot where it is easily viewed, such as in a planting bed near a porch or shady patio. As with hosta plants, their shade tolerance makes Lenten rose plant perfect for woodland gardens. Even though their color becomes less vibrant as summer approaches and is entirely faded by fall, one can still value the persistence of Lenten rose's sepals. They are a constant in the garden for about six months. One of the best perennials for shade, hellebores will retain their vibrant sepals and foliage without a lot of sun, except in the winter. An ideal location for hellebores is under the canopy of a deciduous tree, which provides shade in the summer but loses its leaves in winter. This spring flower prefers an evenly moist, well-draining, fertile soil. Amend the soil with compost to improve the vigor of the plants, or fertilize with manure tea. You can divide the clumps in spring to gain additional plants, or propagate from seedlings that have sprouted up. Helleborus prefer a moist but not constantly wet soil, which can invite disease. Provide enough water to keep soil moist during prolonged periods of hot and dry weather but once established, hellebores can tolerate dry conditions. Although its foliage is evergreen, hellebores may become scorched and tattered in extremely harsh winters. Protect the plants from cold winds with a light fabric covering or cold frame. 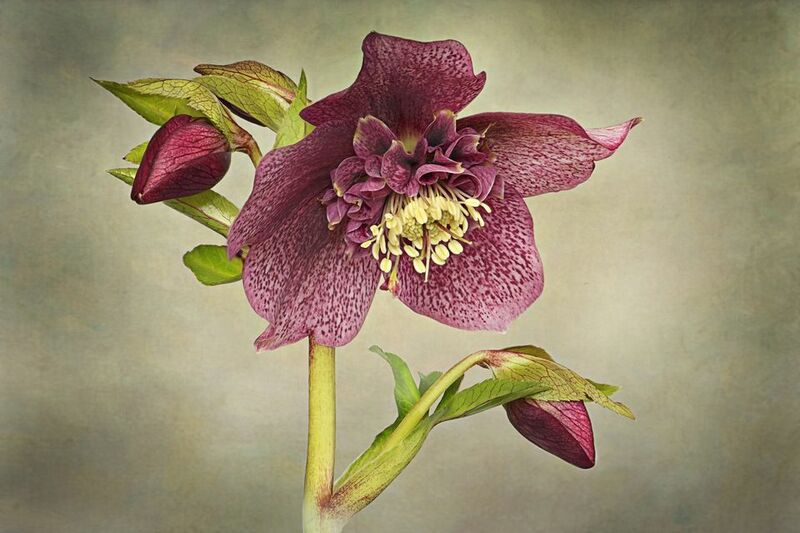 Regularly amending your soil with organic matter is enough for the hellebore, but for larger plants, you can fertilize with a balanced fertilizer in early spring as new foliage is beginning to emerge. Grow them from seed. Collect seeds in May and June and sow them immediately. Seed-grown plants usually flower after two years. Let them self-sow. Space the seedlings out so you don't wind up with unexpected hybrids. Self-sown hellebores take three years to flower. Divide them. Division is a great way to create an exact replica of a particular plant. Dig as much of the root as possible and divide using a sharp knife. You can replant larger divisions in the soil and smaller ones in pots. Veratrum viride 'Indian Poke': A wildflower native to the northeastern United States and southeastern Canada. Seek medical attention from a health care provider if these symptoms develop. Dogs, cats, and horses that ingest the plants may experience drooling, abdominal pain and diarrhea, colic, and depression. Milder symptoms usually dissipate within 24 hours but poisoning can be considerably more serious if large quantities are ingested. If you suspect your pet has eaten a large quantity of Lenten rose, seek veterinary care. Once the flowers have started to brown at the tips, they should be cut back to the base of the plant. Allow the evergreen foliage to continue throughout winter until the blossoms begin to expand, at which time browned and ragged foliage should be removed at the base. Lenten roses are a deer-resistant plant but they are occasionally susceptible to leaf spot and crown rot. Preventative fungicides can be used early in the growing season to reduce fungal infections. Proper spacing will also help prevent fungal diseases from spreading among plants.